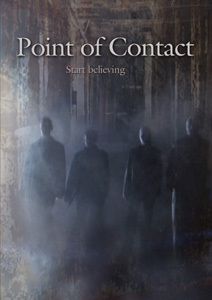 DVD Giveaway: "Point of Contact"
Echelon Studios and Singa Home Entertainment are giving away 5 free copies of their new supernatural thriller, "Point of Contact." To enter, just tell us whose ghost you want to meet, or whose ghost would scare the pants off of you. Please post responses in this thread. I would talk to Charles Darwin, because I like penguins. I was always scared of flying, so meeting the ghost of Amelia Earhart would be way scary. Re: DVD Giveaway: "Point of Contact"
It might be cool to meet the ghost of Boris Karloff but then again, if the experience was anything like "Thriller" episode "The Incredible Doktor Markesan", it might be downright terrifying. I'd want to meet the ghost of Marilyn Monroe in the hopes that having been dead for so long she'd be desperate for supernatural phantasmal lovin'. I'd be afraid to meet the ghost of John Wayne Gacy, especially if his spirit took the shape of his Pogo persona... the only thing freakier than a child molesting killer clown is an undead child molesting killer clown! I'd like to meet the ghost of the Marquis de Sade. Since his whole philosophy revolved around the idea that there was no afterlife, I'd be curious as to how ghosthood had changed his beliefs. I'd be afraid to meet the ghost of Alistair Crowley, since the fact of his ghosthood would suggest that he was actually right about a lot of things. Also, I suspect he'd make a particularly mean-spirited spirit. Glad to see the free DVD contest back, even though I never win. Aldous Huxley, I just think that'd be neat. Nathaniel Hawthorne, so I can tell him how much I hate The Scarlet Letter. as for a scary one, I'll bet the ghosts of either Hitler or Jack the Ripper would be pretty freaky. The ghost I'd like to meet and would also scare the pants of me would be Jesus...but then again, who wouldn't be afraid of that? I would like to meet the ghost of President Kennedy. This country needs help and he can reclaim his presidency. The ghost that would scare me to whizz would probably be Rasputin. The ghost I would most like to meet is Ed Wood Jr. The ghost I'd like to meet is Rod Serling. Any man who can make me remember Burgess Meredith wearing Coke bottle eyeglasses saying, "Time enough to read at last," since my childhood has my vote. Although I take off my glasses to read I love this episode the best. The scariest ghost has to be Pontius Pilate. Any ruler who can sentence the son of God to death then wash his hands of the whole ordeal is downright scary. I would like to meet, and at the same time NOT like to meet, the guy responsible for more deaths than Hitler even. The Man With The Plan...Joe Stalin. I would also like to meet the ghost of Jack the Ripper to see who he really was. M. J. Druitt? George Lusk? It would be nice (and scary) to have that mystery finally solved. I would like to meet the ghost of Max Schreck to see if he looks as scary as he did in NOSFERATU. I would like to meet the ghost of Fay Wray to see her radiant beauty with my own eyes! I would like to both meet and find terrifying Kitty or Greeny Greenwood's ghost. I think that tops all the dudes mentioned in the other posts. I would like to meet the ghost of the late Heath Ledger. To tell him how awesome he was in "The Dark Knight". I don't know if I would like to meet any ghosts. It seems like (going off of the reality shows, movies, documentaries and folklore) that they can do more harm than good. Possessed Regan from the Exorcist. The female ghost from the Grudge. Emily Rose after she get possessed. I get the shivers watching these movies.